We love LIKEaBIKE‘s new ROCKaBIKE contraption that converts a balance bike into a rocking toy. You probably learned how to ride a bike with the assistance of plastic training wheels. But the best way for kids to learn how to ride free on two wheels now? 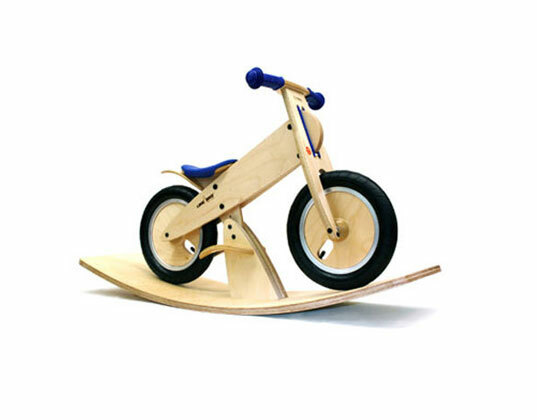 Wooden pedal-free balance bikes like LIKEaBIKE. While the concept is a brilliant way for kids to learn how to ride a bike, it does take away one good thing about those old training wheels — they extended the life of your big kid bike by giving you a few months or years to use it when you’re smaller and less coordinated. In the same way, the ROCKaBIKE extends the use of your pedal-free bike, by letting younger kids get a feel for the seat and handle bars while rocking. We love LIKEaBIKE's new ROCKaBIKE contraption that converts a balance bike into a rocking toy. You probably learned how to ride a bike with the assistance of plastic training wheels. But the best way for kids to learn how to ride free on two wheels now? Wooden pedal-free balance bikes like LIKEaBIKE. While the concept is a brilliant way for kids to learn how to ride a bike, it does take away one good thing about those old training wheels -- they extended the life of your big kid bike by giving you a few months or years to use it when you're smaller and less coordinated. In the same way, the ROCKaBIKE extends the use of your pedal-free bike, by letting younger kids get a feel for the seat and handle bars while rocking.